I saw in the Pazzles Craftroom where they made popped up borders and had to try it with one of our smaller stamps. I really like the way it came out. I've done this technique before but with an exacto knife...this was way easier!! I embossed the butterflies with By the Lake and dyed my ribbon with YR04. The sentiment is actually from one of the new Christmas Stampette Sets. All supplies can be found at Sparkle N Sprinkle. Neat idea! Will definitely have to give that one a try! Very pretty card and I love the butterflies. I like the color combo too! 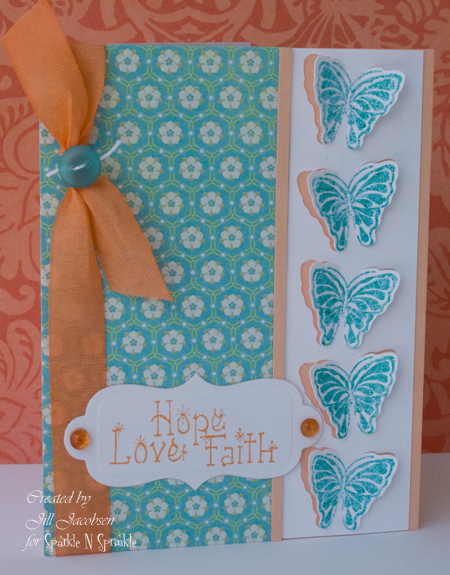 a very sweet card, Jill - the saying is perfect with the butterflies!